Last year, I had a look at two of the first five books in Asia Publishers’ new K-Fiction series, small books with writing from the new wave of Korean writers. 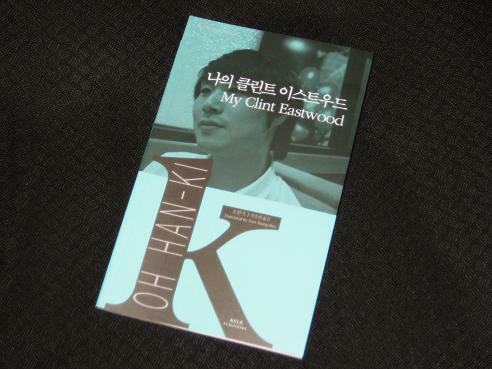 While both of those stories (Dinner with Buffett and Arpan) had a very different approach to the usual inwardly focused Korean fiction, today’s review looks at a book which is even more unKorean in its style. The question, then, for the vacillating reader out there, unwilling to commit to trying the book, is this: do you feel lucky? Well, do ya, punk? “Do you have a room?” he asked in his characteristic raspy voice. Then he smiled vaguely as if acknowledging that he knew that I recognized him. However, this is not the Eastwood of cinematic memory – the super-macho detective/cowboy has gone, leaving a dull old man in his wake, and the writer is deeply disappointed with his screen hero. After a while, the actor moves on, and the writer takes a trip to Texas in the hope of rediscovering the golden era of Westerns. While the past is a different country, though, it’s not one you can fly to from Seoul, and the writer soon learns that the world has moved on, perhaps for good. The set-up for My Clint Eastwood is an entertaining one, a bizarre mix of reflections on the world of movies and Dirty Harry fan-fiction. Much of the humour comes from the disappointment the writer feels when he encounters Eastwood in the flesh, an ugly old man prone to carrying an unloaded gun around (and to asking for a glass of milk all the time). While you suspect that it may all be in the writer’s head, it’s fun just the same. It’s as much as the writer can do to pour the old man a glass of milk and send him on his way. In truth, though, the writer isn’t quite as dismissive as he seems. On some level, he wants to believe in the man who used to dominate the big screen, carefully sounding out his friends and family on their opinion of the actor. Even when he finds that Eastwood is just another faded star, he makes a trip to Texas hoping to prove the opposite. Has the Texas of the Westerns really disappeared? Will Eastwood really be in a bar somewhere? Read on, and you’ll find out. There’s a lot to like about the story and more to read into it than just a comical skit which uses a famous name for effect. The writer is struggling with the complexity of modern life, echoed in the sophisticated films his friends recommend he watch. He yearns for the days of the Western, a simpler, dirtier, riskier time, where morals and actions were black and white. In an era where cowboys seem to have died out, it’s become more difficult to find something worth fighting for, or against. Interestingly, while there are several other obvious themes here, such as the contrast between a screen hero and the flawed human who portrays them, the extra sections at the end of the book, from both the writer and a literary critic, don’t really touch upon them. These sections are very descriptive and don’t really add a lot to the story, which is a shame as other books in the series have given extra insight into the writing. I’d also have to say that My Clint Eastwood occasionally reads as if it were written for an audience that didn’t really know that much about the central character. For Westerners (especially those of us of a certain vintage), Eastwood is still a powerful, iconic figure, whatever you might think of his political views, and it’s hard to see him in the same way Oh’s characters do. Using his name might attract readers to the book, but I’m not sure it’s written in a way that Anglophone readers will appreciate fully. And Clint Eastwood did not sue? Like Scarlett Johansson did (and she won) against poor French author Gregoire Delacourt – and in that case, it wasn’t even the real actress making an appearance in the book, but a look-alike! Marina Sofia – I suspect French libel law is a lot stricter than its Korean counterpart (and that this book is not quite as well known…).